There was a time in your life and there was in mine when a steamboat seemed a more romantic thing than now. A ride on a steamboat was an event. There were thrills and adventure in it. A steamboat trip in retrospect was a subject of thought and talk for several other days. That was when you and I were young. The paint on a steamboat seemed brighter and fresher, the gilt work on the wheelhouses and the pilot house was more lustrous, the little lay figure which usually stood or perched on top of the pilot house was more interesting and the man at the wheel and the man in the engine room were more impressive and important than now. The dinner bell had a merrier tone and the flavor of the food was better. The whistle blew a good deal louder and the paddle wheels turned faster. The boat was swifter, bigger and more luxurious than now. Even the river seemed to be wider and it was so deep that we talked in awe of parts of it where there was no bottom. Don't you recall those thoughts? Now, it is very likely that the steamboat impresses you as a dingy thing which struggles along through a monotonous life. You only travel on it if you must, and the wide river, glittering in the sun or shining under the moon, begins to bore you before you have traveled far. The green banks mean nothing to you except bushes and trees. You no longer people them with Indians and fairies. The dinner bell lacks melody and you are critical if not finicky about the food. John and Mary, you are no longer young, but the state into which you have fallen is due not so much to the years as to the outlook on life which you have come to take on. You like to be bored. You wouldn't feel quite easy if you allowed yourself to be amused. You have come to consider it bad form to take a lively interest in all the things around you. It is a state of mind that is putting lines into your face and streaking your hair with gray. The next time you travel on an old Potomac steamboat and you see a child pointing to this or that and calling out with enthusiasm, “Look at that!” and “What is that?” you must not rumple and fumble your newspaper with impatience. Please do not feel disturbed and inwardly say, “Confound the young one, what a pest he is!” Think of those golden days when the steamboat seemed to you a gorgeous and mysterious thing, when the pilot and the engineer were greater men than presidents and ambassadors, when the river was wide and deep and when your young rich fancy peopled the green shores with Injuns. In the narrative about the Mattano the Rambler referred to a little red book published in 1882 by the owner and agent of that busy boat. Four pages of the booklet are taken up with a list of wharves and wharf agents and merchants using those wharves in the receipt and shipment of freight. The names of these people ought to make pleasant reading to the many thousands of Washingtonians who come or whose ancestors came from the lower Potomac counties. Many of these old wharf agents and shippers look down on as from the skies and it may be that some of them are looking over the Rambler's shoulder and urging him jot down their names and spell them right. The agent at Pye's wharf and Glymont was G.R.J. Hunt; at Grinder's wharf, E.M. Grinder; at Posey's wharf, A.B. Posey; at Smith's Point wharf, S.W. Adams; at Tolson's wharf, S.T. Tolson; at Dill's wharf, J. Thomas Herbert; at Stuart's wharf, A.J. Pemberton; at Mathias Point, B.R. Grymes; Wilkerson's wharf, W.S. Wilkerson; Massey's wharf, T.H. Massey; Beale's wharf, R. McGuire; Mount Holly wharf, F.E. Turban; Nomini wharf, F.L. Unruh; Prospect Hill wharf, C.W. Hutt. The list of merchants in that count in 1882 the Rambler will preserve until another time. A fair part of the space of last Sunday's “ramble” was given over to the old Washington and Alexandria ferry boats, the Fulton, Winnisimmit, Manhattan, City of Alexandria, City of Washington, Columbia, Callahan and Woodruff being mentioned. The Rambler also mentioned the old Potomac steamer George Law, which retired from the regular river freighting trade and became a ferry to Alexandria, making stops at City View, which was one of the new names given to Giesboro point. The Star carried this advertisement during the summer of 1888: “Five-Cent Ferry – New Ferry to Alexandria – Steamer George Law leaves Washington daily 5:15, 8, 10 and 12 a.m. and 2, 4 and 6 p.m. Leaves Washington Sunday 8, 10 and 12 a.m. And 2, 4, 6 and 7 p.m. From Mary Washington Wharf.” “The new family resort, City View,” was doing business in the summer of 1888 and its patrons were served by the George Law, City View in the 90s became Buena Vista and was served by the steamboat Seufferle – if that is the way her name was spelled. The George Law and the City of Washington were in collision early on the morning of September 20, 1888, off Giesboro point. No particular damage was done, but there was a long investigation at Baltimore by Steamboat Inspectors Saville and Cooper, and among the witnesses whose names the Rambler recalls were Capt. Jones of the Law, Capt. J.B. Eskridge of the City of Washington, Engineer Venner o fthe Law and Capt. J.T. Barker of the Lady of the Lake. At one time the steamer Florence was the City View boat. 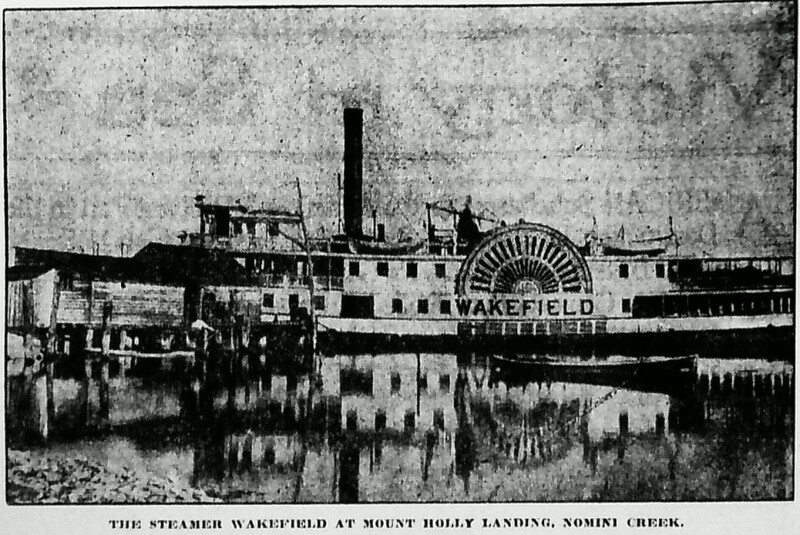 The “Five-Cent Ferry” seems not to have been profitable to the George Law and she returned to the work of carrying freight and passengers between Washington and the many wharves between the capital and Nomini. Her Washington agent in the early 90s was E.N. Middaugh, a small, thin, elderly man, of whom the Rambler cherishes many pleasant memories. One of the old steamboats of our river was the Pilot Boy. Everybody who knew anything about Potomac steamboats knew her, or knew “him,” and yet the Rambler has but a small fund of specific information relating to this boat. There is a big difference between having “general information” and exact information. A thousand persons reading these lines may lay down the paper and take off their spectacles and sigh “Ah, yes! The good old Pilot Boy! I knew her well! I traveled on her once!” Perhaps a thousand readers may sigh “Ah, yes! I knew her well! I traveled on her many a time!” But perhaps only one person out of that thousand, or those two thousand, actually knew the Pilot Boy well enough to write a paragraph of facts about her. The Rambler also “knew her well” and traveled on her, but when it comes to the point of presenting those facts which would tell her story he feels stumped. She was built at Wilmington, Del., in 1857. When she came to the Potomac river the Rambler does not know. The chances are that she worked in her youth on the Delaware or Hudson river, for nearly all Potomac steamboats served their apprenticeship or novitiate on these rivers. Summer arrangement of the steamer Pilot Boy. – The Swift and faavorite iron steamer Pilot Boy, Capt. Joseph White, commanding, will leave Washington every Tuesday and Saturday morning at 7 o'clock for landings on the Potomac river, as follows: Glymont, Sandy point, Liverpool point, Smiths point, Chatterton, Stuart's wharf, Tolson's wharf, Mathias point, Lower Cedar point, Mattox creek, Leonardtown, Longwood wharf, Goughs wharf and Currioman. There was a very interesting and enjoyable entertainment at Marshall Hall yesterday by the Metropolitan M.E. Church and the Sunday school. The Pilot Boy carried down 600 and 150 more went by the W.W. Corcoran. There was kite flying by the Chinese boys of the Sunday school, speeches and singing by an Indian in native costume, and other musical exercises. One event that was quite new with river excursions was the baptism by Dr. John P. Newman of a little daughter of Mr. and Mrs. H.N. Keene. A really happier crowd is rarely seen upon occasions of this kind. Collingwood Beach, well known as Johnsons Springs. – This excursion resort has been fitted up with everything new – large pavillion, dining room, etc. We have a fine spring of cool, running water, the largest on the Potomac; plenty of shade on the grounds, etc. The Pilot Boy, under command of Capt. M. White, late of the steamer Henry E. Bishop, has been expressly fitted up and equipped in first-class order to run to Collingwood Beach for the season of 1888.
of 11th and F sts. Collingwood. – Family Day at Collingwood Beach, 10 a.m., returning at 5 p.m. Gravity railroad, flying horses, shooting and fishing. Take your children for a pleasant outing. It will do them good and give them a change of air and scene. Tickets only 10 cents. For character apply to Capt. White of the steamer Pilot Boy, or F. McC. Criswell, Agent, corner 11th and F.
Coming to think it over and reading these notices, the Rambler believes 1888 is too early to set the Pilot Boy's entrance into the excursion business for colored people. Johnsons Springs, later Collingwood, was a picnic ground for colored merrymakers in the early 90s, but it was probably a resort for white people at one time. Collingwood is on the Virginia shore, about a mile upstream from the River View wharf. The Mary Washington used to land colored excursions there and the Mary in her old age also carried colored excursionists to Motley Hall, a resort which was set up in the hills above the little bay, directly this side of Roziers Bluff, on which Fort Foote stands. Retiring from the excursion business, the Pilot Boy went into the ferry business between Washington and Alexandria. While thus occupied she was renovated and named the Belle Haven, in memory of the ancient settlement on the site of Alexandria. Like so many other old Potomac boats, the spirit of the Belle Haven ascended to the Valhalla of steamboats on clouds of smoke and pillars of flame. Day boat for Albany and Troy – The new and fast steamer Daniel Drew leaves Jay street at 7 o'clock a.m. Tuesdays, Thursdays and Saturdays. The Armenia leaves Harrison street at 7 a.m. Mondays, Wednesdays and Fridays, calling at 30th street. Excursion tickets good to return for one week can be had on the above boats at great reductions. The large and unusually fine boat the New World, which has been anchored in the stream near Alexandria for many months past, went ashore on Wednesday at Smiths Inlet, near Point Lookout, where she had been carried for use as a floating hospital. The New World is about 300 feet long and four stories high. The last accounts represent that several boats were trying to pull her out of the mud. In the early 80s the Armenia ran between Washington and Lower Cedar Point and Blackistone Island. That island had been converted into a pleasure resort by Ed Abner, whom everybody in Washington knew. Of course, you used to go to Abner's Garden, on E street between 7th and 8th, to listen to the music and for other reasons which would be shameful to name in this time of drought. The Rambler's old friend, Gus Bruehl, who has worked on The Star longer than the writer of these notes, recalls to the Rambler that Count Mitkiewitz was associated with Ed Abner in the Blackistone Island venture and that Harry Bowers was for some time captain of the Armenia. Harry Bowers was a son of the celebrated actress, Mrs. D.P. Bowers, who after her retirement from the stage conducted the St. Marc Hotel, on the north side of the avenue between 6th and 7th streets. But the Rambler believes that he will close at this point and return to the subject next Sunday.